Tree sap harvest pegs / spiles. Simple pegs / spiles for harvesting birch sap. Beech parts from a trashed wine rag gets new life. Just turning as I go, no plan just tapered to app. 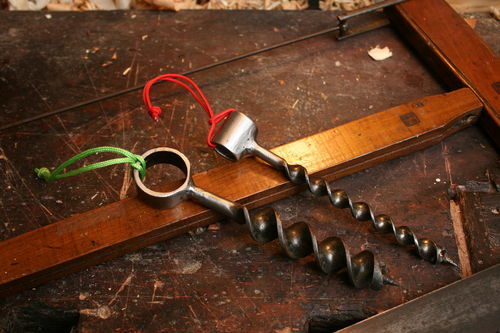 the same size, so it will fit the drill size and a head that will allow one to tie a bottle or bucket to the peg, or make a hole in the side of the bottle that fits over it. I also tapered the inside for easy cleaning and to make the sap run easier. It’s best to use food grade oil and wax. 1. Tree sap harvest pegs..
2. Trashed wine rag gets new life. 6. A few hours in linseed oil. Plenty of videos out there on how to harvest, so I will not go into this. 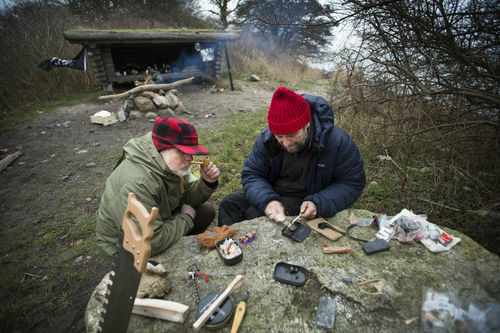 I made a pair of extra sets for two of my friends, here Claus smoking the corn pipe as I teach him how to make fire with different methods, while we hike by the Danish coast in the cold winter. On our last tour we tried to harvest sap but the trees were not ready to give, so I hope we will get some of the spring sap. Made my self a pair of hand drills also, so I can bring them in the pocket. The one with red is for the pegs. Perhaps this can inspire others to harvest natures gifts. Wow those will collect “nature’s energy drink” and what a satisfaction will that be … everything is so nicely done !!! Wonderful, wish I could be there when you tap those trees! Your legacy will be rich my friend. Lovely pegs. Enjoy the natures nectar! Pretty cool, Mads. What do yo do with the Birch sap? Make syrup like with maple trees? It was illegal when I was young to tap birch trees but we did it anyway . We would drill a small hole an stick a piece of pie cut in half for this and a tin can to collect the sap . My Dad used it on his hair to make it grow and it did work well and also drank it . Just did the New York Times cross word puzzle today and found out that the tap is called a “Spile”. New to me. That’s the story of all my projects – no plans – make as it goes. This is a very interesting post, Mads. From the looks of your shop you have a tool for just about anything. And may you always be happy in your work, my friend.